Go bold and moody for your next room makeover! Check out the best navy paint colors from some of the most popular brands! Two weeks ago I let you know we were going to make over our powder room and class it up a little. With bold, rich colors and high-contrast finishes in mind, we set to work creating the dream mood board for this space and slowly working our way down the to-do list. We took down the clutter-filled cabinet and finally settled on the perfect navy paint color. Just like our battle finding the perfect gray for Mini Me’s bedroom last year, it was quite the battle trying to find THE PERFECT navy. Not too gray. Not too dark. Not too purple. 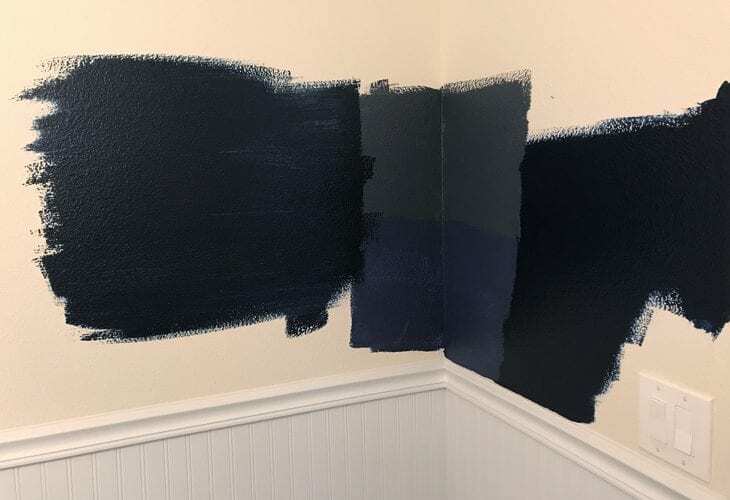 After asking around A LOT and perusing Pinterest and online paint shops we finally selected the perfect bold and rich navy! We went with Sherwin Williams Naval. It’s the perfect, rich navy paint color! This is how the room looks right now. Sidenote: We might be a little crazy, but decided to paint the ceiling too! Eek! We can always paint it back white if we hate it, but I don’t think we will! Was that a bad idea? Only time will tell! So as I did research I kept coming across the same paint color names over and over again and rather than keeping that info to myself, I figured I should share it with you! 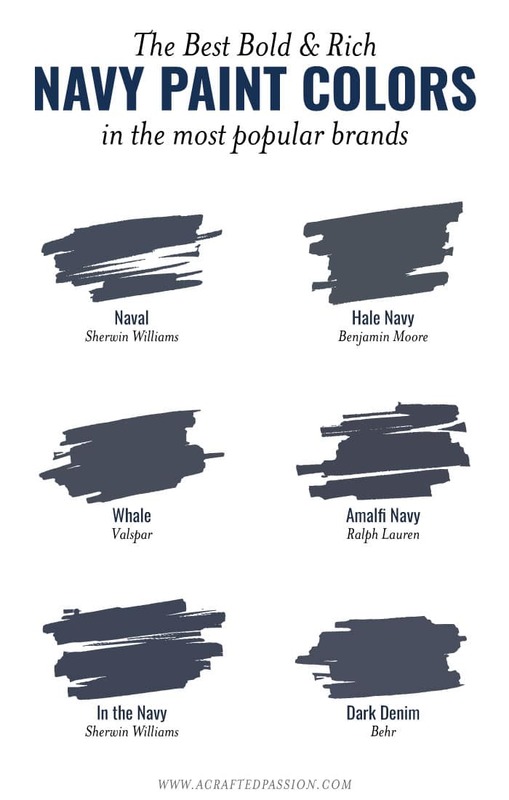 If you’re on the hunt for the perfect navy paint color but have a favorite brand, here are the most closely related paint colors to what we did in different brands. Did you see the mood board for our bathroom shared last week? Check out the design plan here! 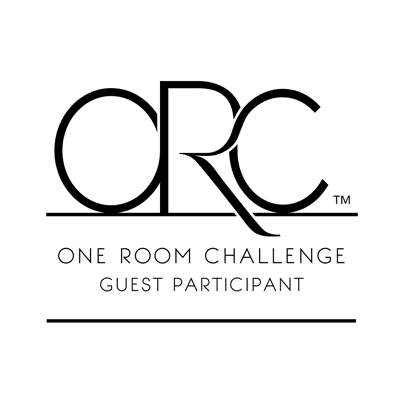 Check out all the room’s that are being transformed this season over at Calling It Home! Thanks, Linda, for hosting! It is crazy how many variations of a particular shade there are. We just went through this with Gray in our basement! I love the color you ended up with. Very nice! I am also a fan of Hale Navy too, looks similar to your choice. navy is SO hard – it can go purple so fast! looks like you made a great choice! Can’t wait to see the ceiling, should look great! Love the navy you chose. The space is going to be gorgeous. I have always been a fan of Hale navy but I am really liking the other navy blues you pulled together! Can’t wait to see the reveal! I agree Navy is the new black and I’m a big fan of SW Naval too. 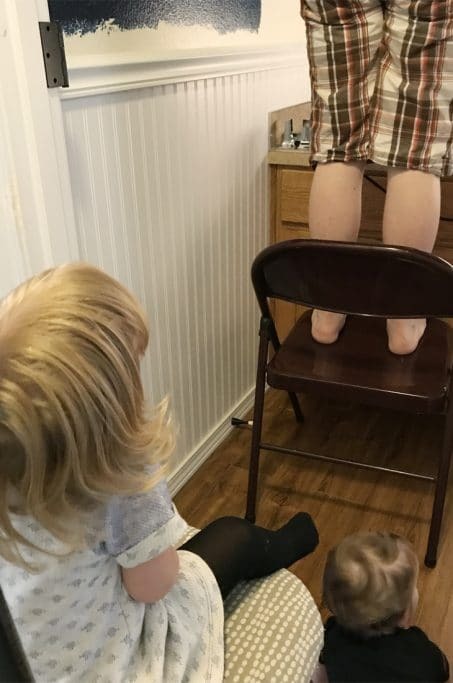 Your little helpers are adorable. I am so glad to see you are going bold with that paint color!!! I wanted to do that in my room, but chickened out, lol!! I am keeping note of the Valspar color (Valspar is my go to paint brand) in case I change my mind. Can’t wait to see next week!! I love that Navy color!! I have been toying with the idea of painting a wall in our living room navy, this post has helped me a lot. It’s awesome! I love that you painted the ceiling too- good choice! Sooo cool that you painted the ceiling! love that! 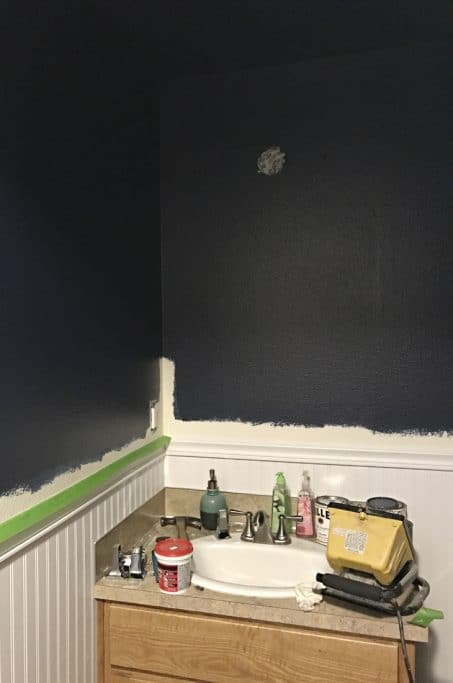 I painted my son’s nursery hale navy and we loved that it looked black sometimes and navy others. Can’t wait to see this space. You picked a beautiful colour! Love it! I love Navy paint! I can’t wait to see the whole room! Gotta love a deep navy hue!